This photo tutorial shows how to make cloth wipes for your baby using either a sewing machine or serger. Save money, eliminate chemicals, and reduce waste with this quick and easy project. This tutorial gives you step-by-step instructions to make cloth wipes that are just the right size to fit in a regular wipes container or wipes warmer. A couple hours of sewing could save you a few hundred dollars in wipes over the course of your baby's time in diapers, so if you know how to sew, you can save yourself a lot of money! If you already use cloth diapers, cloth wipes can be a logical next step! Not only can they be reused, saving you money (and helping the environment! ), they can also be washed with your cloth diapers (no more sorting!) Plus, cloth wipes actually clean your baby up better, and they don't contain any chemicals (like many of the disposable wipes). 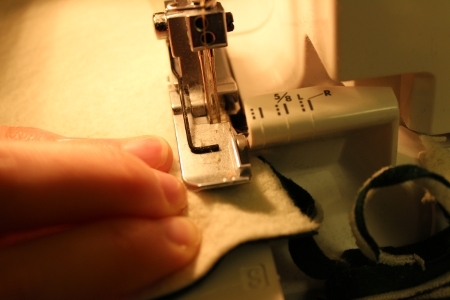 So, if you're looking for a simple cloth diaper accessory sewing project, read on. Optional: rotary cutter, mat and straight edge - this makes for quick and easy squaring fabric up, but if you don't have one, scissors work just fine! 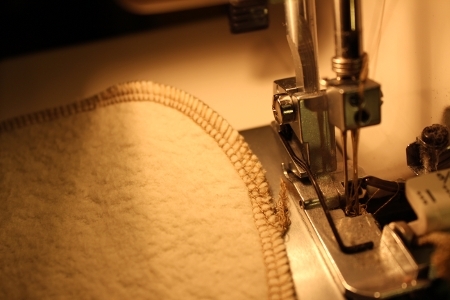 Cloth wipes can be made from just about any fabric, including used towels! It's best to pick at least one layer of one absorbent natural fabric (cotton, bamboo, hemp) that will hold water, but microfleece or minky can make a great second layer for a softly textured wipe! For the wipes below, I used a flannel/sherpa combination and a flannel/microfleece combination. Tip: Pre-wash any dark colored fabrics on hot with your regular cloth diaper detergent. Add a scrap of white fabric so you can test to make sure that the fabric doesn't run! The last thing you'll want is for your homemade wipes to transfer dye to your wonderfully white cloth diapers! If you've bought cloth wipes - or looked at them in a cloth diaper store - they've no doubt had professionally serged edges. 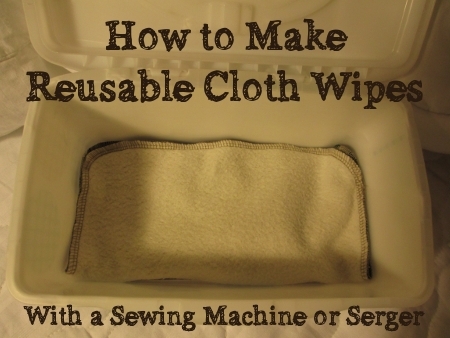 But don't fear if you don't have a serger - you can still make cloth wipes using your sewing machine! They might not look as beautiful, but they will function just as well as their serged counterparts! 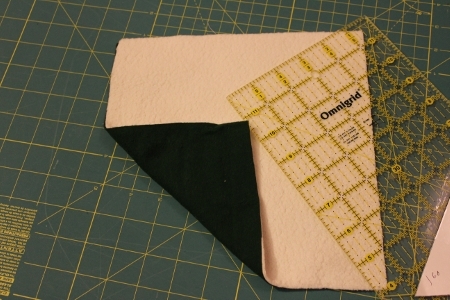 Here we'll show you how to make cloth wipes by finishing the edges using a zig-zag stitch on your sewing machine. 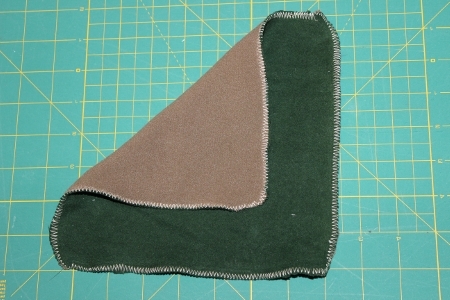 First, trim the corners on your fabric squares so they are rounded, as shown below. Next, be sure to change the settings on your sewing machine. I use the widest stitch width (6 on my machine), and a 1 for stitch length. You can experiment on a scrap to see what you like the look of before you get started with your actual wipes. 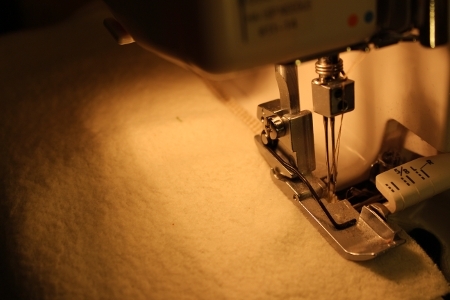 Next, lay your fabric under the presser foot, and zig-zag, allowing the outside of the stitch to fall slightly off the edge. This will keep woven fabrics from unraveling later on. Here's the finished wipe. This one is a combination of soft brushed flannel and microfleece. I bought both pieces of fabric from the "ends" bin at my fabric store. 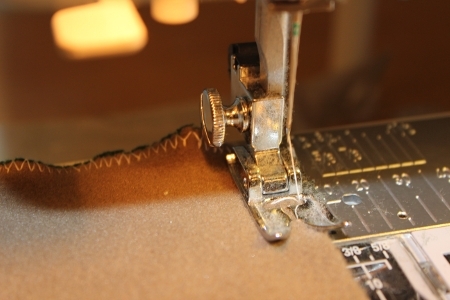 Start at one corner, and place your fabric under the serger presser foot. Serge along the first edge. The corners are a bit tricky. You can stitch straight through and remove the wipe and start again down the next side for square corners, or you can round them with the serger. It takes a bit of practice to get a perfectly rounded corner, but wipes are a great place to practice! 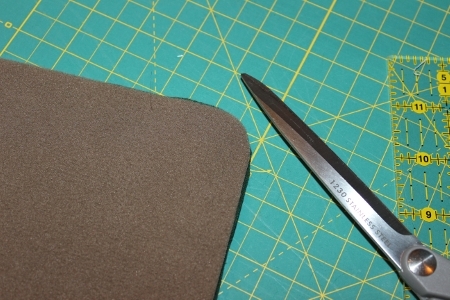 Push your fabric into the knife to trim, as shown below. Continue serging around the wipe until you reach your starting point. Serge off, and then trim any excess thread back. Ready to Use Your Cloth Wipes? 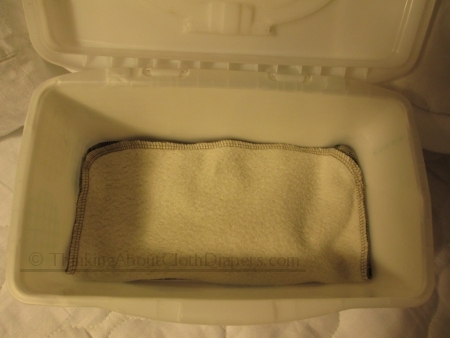 You can place your cloth wipes in a commercial wipes box or wipes warmer. Place them in a small wet bag to take them with you when you go places, too! Disclosure: The opinions expressed in this post are entirely my own, and your experience with the product may differ from mine. I only recommend products or services I use personally and believe will be good for my readers.This article does contain affiliate links. I am disclosing this in accordance with the Federal Trade Commission’s 16 CFR, Part 255: “Guides Concerning the Use of Endorsements and Testimonials in Advertising.” For more information, see our Disclaimer and Copyright. For information on cloth diaper tutorials, plus fabric and pattern suggestions, go back to Making Cloth Diapers.